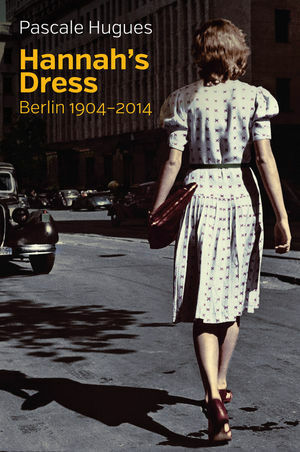 Hannah's Dress tells the dizzying story of Berlin's modern history. Curious to learn more about the city she has lived in for over twenty years, journalist Pascale Hugues investigates the lives of the men, women and children who have occupied her ordinary street during the course of the last century. We see the street being built in 1904 and the arrival of the first families of businessmen, lawyers and bankers. We feel the humiliation of defeat in 1918, the effects of economic crisis, and the rise of Hitler's Nazi party. We tremble alongside the Jewish families, whose experience is so movingly captured in the story of two friends, Hannah and Susanne. When only Hannah is able to escape the horrors of deportation, the dress made for her by Susanne becomes a powerful reminder of all that was lost. Pascale Hugues is a French writer and journalist who has reported for the French newspapers Libération and Le Point from Berlin for over twenty-five years. She also writes in numerous German publications and is a columnist for the daily newspaper Der Tagesspiegel. Chapter 8 The Spitting Image of His Father! Chapter 9 We have to save the furniture! "Hugues brings the tumultuous twentieth century to vivid, messy life through the memories of the men and women who lived in the community. It's a testament to the human costs of catastrophe and the resilience of ordinary people in the face of unthinkable struggle." "More than a one-place study, this engaging memoir reaches beyond the blinds of a quiet Berlin street to provide a window into 20th century German and world history via the prism of human experience." "This is a terrific book. Hugues writes very well and she has a real eye for the killer vignette. Her gallery of characters is engrossing and, in one or two cases, unforgettable. Hannah's Dress will find an appreciative audience among all those interested in the Holocaust and twentieth-century German history generally." "This unusual memoir uses the author's personal experience living in one street in Berlin as a window into the German past. She reaches out to elderly Jewish Holocaust survivors and refugees around the world who once lived on her street, and in her sophisticated narrative she peels back the layers hiding individual experiences so elusive to many professional historians." "Hannah's Dress is a book that is both tender and bittersweet, shocking and full of surprises. It is a unique, moving and very well-written narrative that has justly been awarded the Simone Veil Prize." "Pascale Hugues' account of her street and its inhabitants is a little wonder of a book." "Hannah's Dress is an endlessly fascinating unpicking and re-weaving of history, a meticulously researched and hugely affecting academic work with all the epic sweep and emotional heft of the most engrossing of novels." "Hugues's book, which won the European Book Prize in 2014, is a beautifully written miscellany of emblematic stories." "Finely researched and lovingly written." "This is a gentle, thoughtful and non-sensationalist account [...] and certainly worth reading - irrespective of whether or not you know Berlin." "Move over Isherwood: Pascale Hugues has taken your storyteller crown, proving the German truism that the best stories really are lying around on the streets."